Forecasters have predicted heavy rain and thunderstorms across the north of Scotland this weekend as the UK prepares for some of the hottest temperatures on record. In 2003, thermometers reached an all-time British high of 38.5C in Kent – however, the Met Office expects this figure to finally be beaten today in some of the warmest parts of south-east England. Scorching heat is also forecast for much of Scotland this afternoon, with highs of 27C in parts of the Highlands and Moray. But meteorologists expect today’s warm weather will be followed by severe downpours, thunder and lightning across the country starting late this evening and continuing through the night until late tomorrow afternoon. Met Office forecaster Simon Partridge said: “Throughout Friday, there’s a risk that a band of thundery showers from further south could clip the far east coast of Scotland as the day goes on, including Aberdeen – but most of the north of Scotland will miss the worst of it and remain dry until the evening. “This afternoon, many areas will be a lot hotter than they’ve been recently. “One of the hottest parts of Scotland is looking to be the Moray Coast, and parts of that region could see temperatures as high as 29C. 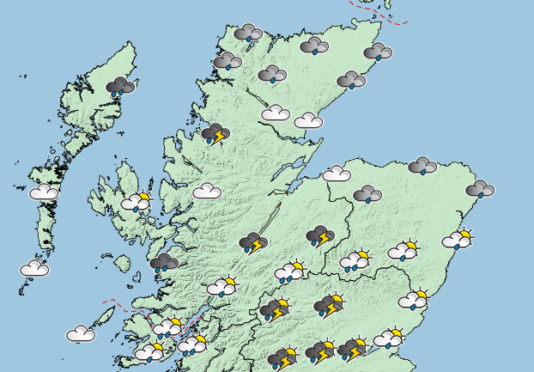 Widespread thunderstorms are forecast to continue across the country until around 7pm tomorrow, and Sunday is expected to be a much drier day in many parts of northern Scotland. Mr Partridge said the recent spells of warm weather are expected to return next week, once the period of unsettled, thundery weather passes.